Information contained in this tribute was found in several sources. John Raymond Crouse was born on 7 February 1952 in Royal Oak, Michigan to R. E. and Rosemary nee Kern Crouse. According to the 1940 U.S. Census, R.E. was 14, an older brother, Robert, age 16, were living at the home of their parents, Eulous and Lathel nee Rogers Crouse in Detroit. Both parents worked at an unidentified "auto factory" and both of the sons were identified also working as new laborers also for an auto factory. John achieved the rank of Eagle Scout and attended and graduated from Kimball High School in nearby Kimball, Michigan in 1970. That same year, John began his very successful Navy career of 22 years. He attended recruit training at the Navy's Great Lakes, Illinois training command where he volunteered for submarine duty. He attended Machinist's Mate Class "A" School also at Great Lakes and then he continued his education attending and graduating from the Submarine Nuclear Power School and Training Unit located at Mare Island, California and Idaho Falls, Idaho, respectively, in 1971 and 1972. By this time he had been promoted to Machinist's Mate Third Class and according to Internet sources ( Together We Served and USSVI.org's Deck Log), John's first Navy vessel that he served on was the guided missile destroyer USS Henry B. Wilson (DDG-7) (1971). Notes made on his USSVI's Deck Log profile stated that he served on board the destroyer while he was in-between attending the two submarine nuclear power schools. His first submarine assignment was the nuclear powered fast attack USS Flasher (SSN-613) where he served from 1972 through 1976. He became qualified in submarines on the Flasher and was promoted to the rank of first class Machinist's Mate. He then served on the nuclear ballistic missile submarine USS George Bancroft (SSBN-643) (1978-1979) and was promoted to Chief Machinist's Mate during that time. Two months after he made Chief, his father R.E. passed away at the age of 54 and never got to see John in his Chief's uniform. John continued his very successful naval career and subsequently served on three nuclear fast attack submarines to include: USS Puffer (SSN-652) (1980-1983), USS Cavalla (SSN-684) (1983), and USS Buffalo (SSN-715) (1986-1989). In between, he served some shore duty assignments that included the Maintenance Training Group located in Saratoga Springs, New York (1976-1979) and COMSUBRON ONE in 1983-1986 where he was the squadron's Career Counselor. Notes from his Deck Log profile added that he also was assigned the special and esteemed duty as the Squadron One's Luau Coordinator and Pig Cooker. While serving on Buffalo John was promoted to Master Chief Machinist's Mate, the Navy's highest enlisted rank. According to "What Are You Doing Here", written by Sheila McNeill, John received 2 Navy Commendation Medals and 4 Navy Achievement Medals during his career. Additionally, the crews he served with received 7 Battle E Awards, numerous letters of appreciation and Citations and in his words: a very fulfilling adventure to save a great history. Sheila added, "Although he said his best award was being the son of R.E. and Rosemary Crouse and regretted that his Dad never saw him as a Chief Petty Officer. His last navy assignment was serving on the submarine tender USS Canopus (AS-34) from 1989 until he retired in 1992. The home port of Canopus at the time was Kings Bay, Georgia located a few miles from St. Marys. 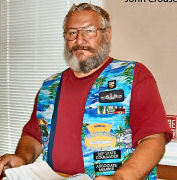 John then settled in Camden County, Georgia and became involved in the beginnings of the St. Marys Submarine Museum. 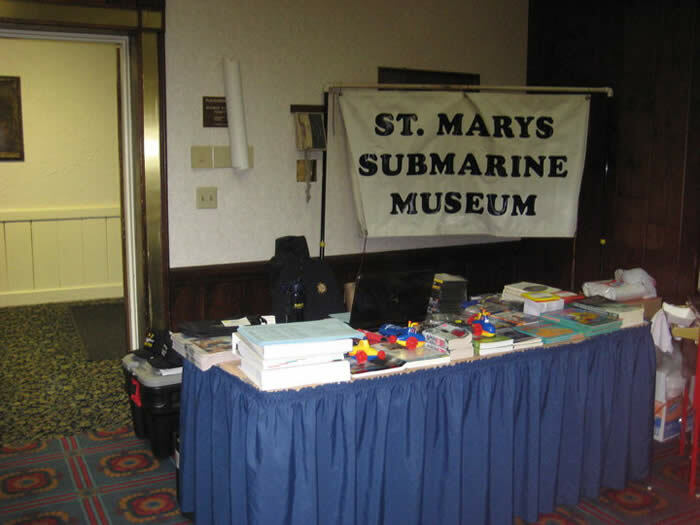 Shown below are photographs that were captured off the Internet reflecting John's career while serving at his last duty station, the St. Marys Submarine Museum. John Crouse's last facebook postings offer additional images as his page is still active. Here following is an extract from Sheila McNeill's book. In it she included the entire eulogy she gave at John's memorial. "Well if you are reading this it looks like I've completed my last transfer of duty: 'Eternal Patrol' is a submarine term used by subvets who have departed on their last, eternal, patrol. First, I wish to say I've had a hell of a good time getting here. 18 Years in Michigan, with family and friends. Mom and Dad (My Dad is now deceased) thanks for give me so much. Kind of missed the 4 seasons of the year in Michigan, but do not miss the snow. Sometimes I still act like a kid, which I think is why I had so much fun in the Navy 22 years in the Navy, with 13 in Hawaii. There they sent me to sea; with stops in Hong Kong, Philippines, Korea, Australia, Thailand, and let's not forget Guam. Then there was the Arabian Sea that we now hear so much about. Duty stations don't get any better than Hawaii. Also visited some Russian ports, but they didn't invite us in." "What Are You Doing Here?" is a must read if you want to read more stories about John and the history of the St. Marys Submarine Museum. When John left us, he left his mother Rosemary, his brother Steve and his family, a sister, Navy and her family and many aunts, uncles, cousins and friends. Mahalo and Aloha!